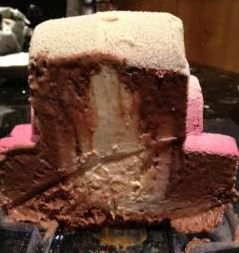 Last year Haagen-Dazs created a MOON CAKE which was so wonderfully complex that it required instructions. This year, they have created a thing of beauty which is just full of yum (and all sorts of hidden delights). 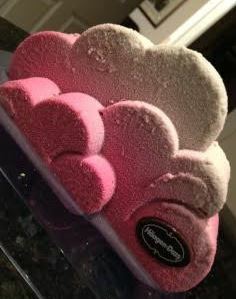 The cloud cake was created by Front for Haagen-Dazs and has a core of their new Marc de Champagne ice cream with their delightful chocolate ice cream around this central core. The cloud shape is absolutely gorgeous to look at with a beautiful multi-cloud effect which has been flocked white with a hint of sunset pink at the bottom. The image is absolutely beautiful. The hidden surprise in the base of a chocolate crackle was extra special as we got to experience so many different textures in a single bite. Inspired by snow clouds from the designers homeland, this festive, money can’t buy dessert is the best way to indulge in style this Christmas. Overall this piece of gorgeous deliciousness is just that – yummy and beautiful. It is visually stunning along with being delicious to eat. The plastic case protects it perfectly and mine was delivered in perfect condition. It is the perfect stunning dessert centrepiece if you want to impress or if you just want effortless delicious dessert. 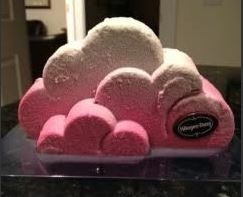 2 Responses to Haagen-dazs Cloud Ice Cream Patisserie Cake – WIN ONE! This looks DELICIOUS! 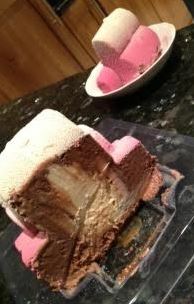 I love haagen daz.